The protest in Ahvaz continues, despite the repressive measures the government has taken. The Ahvaz steelworkers went on strike in November in protest of not receiving their wages for several months. The workers were protesting for several months prior to the strike for basic rights, but the regime has yet to respond to any of their demands. Reports from the MEK sources inside Iran indicate that the protests have continued. The workers blame the regime for their situation, saying that the government’s corruption is responsible for the factors leading to their protests and strikes. At Saturday’s protest, the workers chanted, “You’re taking advantage of Islam and have made the lives of the people a misery!” and “They speak of Hossein but they pride in their thievery!” The chants were in reference to the regime’s perversion of religious edicts and principles in order to rob the Iranian people of their wealth. Imam Hossein refers to the grandson of the Prophet Mohammed, a revered symbol for Shiite Muslims. 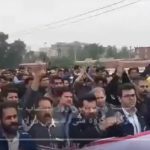 The protests by the Ahvaz steelworkers are occurring simultaneously to strikes by the workers of the Haft Tappeh sugar factory in Shush. Both sets of striking workers are in Khuzestan Province, and they have been supportive of each other throughout the protests. The Ahvaz steelworkers and Haft Tappeh factory workers have gained support from people across Iran, including students, teachers, truck drivers, merchants, and youth. Each of these groups have expressed solidarity with the striking workers. The MEK and the Iranian Opposition have also expressed their support for the workers’ strikes, and Mrs. Maryam Rajavi, President-elect of the National Council of Resistance of Iran (NCRI), urged others to join the workers in solidarity with their protests. As the strikes and protests have gained international attention, the striking workers have also received messages of support from workers’ unions and syndicates from around the world. Strikes and protests have become common in Iran over the past year. The economy is in free fall, and the regime’s corrupt policies have left Iranian workers no recourse other than to take to the streets to protest. Regime officials have warned that a crisis is brewing due to workers losing their trust in their employers and the government.